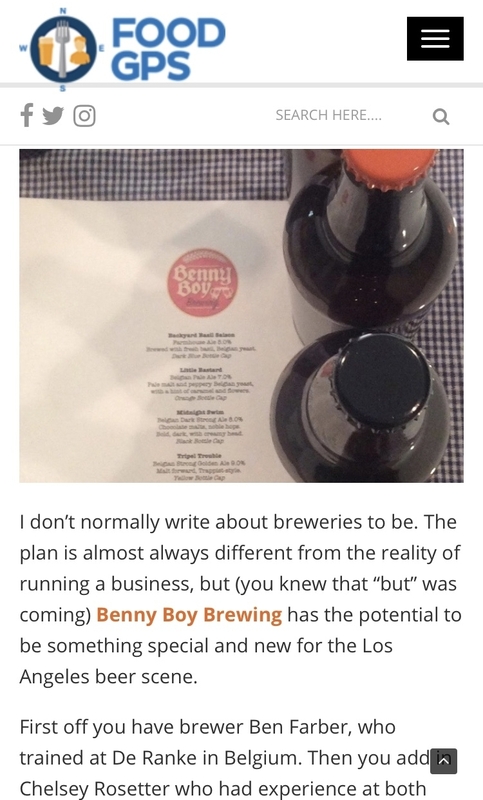 Benny Boy Brewing is a collaboration between husband and wife duo Ben Farber and Chelsey Rosetter who have been researching and preparing for this project for more than five years. This has included consultations with industry experts in every field involved, and extensive brewery tours and meetings with brewers all over the U.S. After three trips to Belgium, they have solidified the concept and have the knowledge and confidence to execute it. Farber is an accomplished brewer with over nine years of brewing experience including a six-week apprenticeship under brewers Nino Bacelle and Guido Devos at world-renowned Brouwerij De Ranke in Belgium. Three years ago, he designed and built his own nano-brewery in Chinatown for recipe development. Farber is also a licensed general contractor, and has been a successful small business owner for over 12 years. Rosetter is a communications professional with over six years of experience, including events and marketing positions at Eagle Rock Brewery and Dry River Brewing. Before that, she was a publicist for the Sundance Film Festival, Center Theatre Group and the Geffen Playhouse. Rosetter's publicity background will help ensure BBB is positioned as an important newcomer in the L.A. beer scene from day one. A second generation Georgia pitmaster, Ryan Lamon is advising on the implementation of the Backyard wood fire grill, and is our gateway into the LA culinary community. With over 15 years of experience working in kitchens all over the U.S., Lamon grew up entrenched in southern barbecue and started helping his father smoke meat when he was seven. Career highlights include a Bon Appétit Best New Restaurant nod in 2012 of Plum Alley in Salt Lake City. In L.A, Ryan started Peaches’ Smokehouse & Southern Kitchen (a gourmet BBQ and food truck) and Poppy + Rose (brick & mortar restaurant DTLA) before moving on to operate his catering/ consulting business, Smoke & Vinegar. Jeremy Light is a restaurant professional with over 10 years of industry experience. Among other titles, he has worked as general manager at many fine establishments including Bar|Kitchen and Sunset Marquis, and specializes in restaurant PR and grand openings; concept development and expansions; staff hirings and trainings; and beverage programming. He has had his own consulting business since 2012, working with clients to renovate, restructure and develop their restaurants and hotels and help to evaluate management teams to streamline operations and reduce labor costs. With over six years of restaurant general management experience, Dan Pearl is currently the Director of Restaurant Operations for Accor Hotels where he oversees all of the restaurants/bars for North America, South America and Caribbean regions (215 venues) - including openings, concept creation and training for all venues. Before that, he was the Director of Food and Beverage Outlets for Fairmont Miramar Hotel & Bungalows and General Manager at Superba Food & Bread. He is a certified Sommelier, and his skills include conceptualizing and opening restaurants; brand development; purchasing and delivery; hiring and staffing; beverage programming; and maintaining appropriate food, beverage and labor costs.